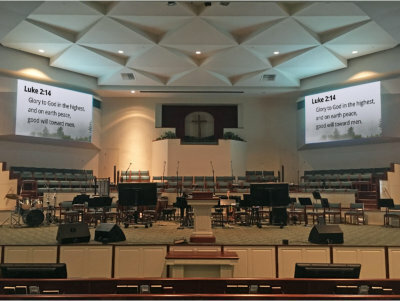 Longwood, FL – December 2017… With its goal of seeking, engaging, and encouraging others through a life-changing Christian journey, First Baptist Sweetwater is a church with a wide range of ministries and related programs designed to help its members find a meaningful worship experience. In an effort to make services more appealing, church management recently elected to upgrade their sanctuary with projection technology drawn from the catalog of Rancho Santa Margarita, CA-based Eiki International, Inc.
Creative Sound & Lighting Solutions of Cape Coral, FL, an AV installation company primarily focused on the House of Worship market, but also providing services for entertainment venues and other commercial markets, was contracted to handle the deployment of the church’s new projectors. Rob Robinson, Creative Sounds’ co-owner, discussed the project and his reasons for selecting two Eiki EK-510U 7,000 ANSI Lumens, WUXGA, 3 LCD projectors.